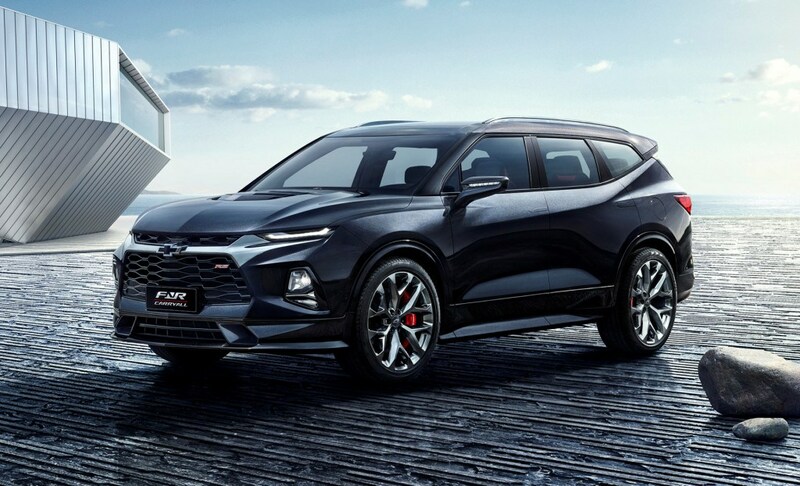 With China quickly becoming one of the largest markets for new vehicle sales, it’s no wonder why Chevrolet decided to unveil the FNR-Carryall Concept at the 2018 Guangzhou auto show. This is the second SUV Concept to feature the bold new styling that future Chevrolet SUVs will embrace. The 2019 Chevy Blazer Concept was the first to feature this radical new styling. Unlike the Blazer, however, this will not be an all-new model in the lineup. Most likely, this will be the redesigned and updated version of the Traverse. Like the Traverse, the FNR-Carryall Concept features 6-passenger seating across three rows. A 10-inch touchscreen is the predominant feature on the dashboard with Camaro-esque circular air vents with red accents completing the look. On the outside, the front fascia is almost identical to that of the Chevrolet Blazer. This particular concept is sporting the RS badge which is why it’s been fitted with the massive 22-inch wheels, Brembo brake calipers and vented hood. FNR is an acronym for Chevy’s slogan of “Find New Roads” and has previously been used on the FNR-X Concept. That particular concept will not see the light of day but some of the styling cues are evident in this new Carryall concept. When and if this FNR-Carryall Concept sees production is still up in the air.